During my college years, I had intentionally done most of my internships in Mumbai; I loved the city from my first visit, and in spite of my limited travels, I was confident that Mumbai was the greatest city on earth - from the hustle and bustle of the streets to the affordable keema pav, anything and everything seemed fascinating. As a youngster in the city, I was always up for some adventure, in spite of the fact that I never had more than a couple of hundred rupee notes in my wallet (sadly nothing has changed on that front). After work, our group of 3-4 guys, who mostly worked at offices near Nariman Point, would walk our way up to Marine Drive, and do nothing but sit and stare at the vast ocean stretching out in front of us. This was our everyday routine. We didn’t talk much, and the term ‘selfie’ hadn’t made its way to the dictionary yet, so we just sat and enjoyed the view, for hours. It was on one of those heady, hopeful days that one of us had remarked that if by chance we ever ended up working in Mumbai, we would visit Marine Drive every day after office. And all of us had immediately agreed. I have been living in Mumbai for a quite a few years now, and I can’t even remember when was the last time I visited Marine Drive. The fellow who had suggested the idea of meeting up every day at Marine drive, well, he is in Mumbai too, but we rarely speak, let alone meet, but that’s a story for another day. I guess that’s life. With time, your priorities change, old habits and preferences wither away, but they don’t quite die - so long as you visit them once in a while in your memories. And while on memories and Mumbai, there’s one particular incident that I can’t help but recall every time I cross Bandstand. A Saturday morning (probably closer to noon). I woke up leisurely at the shabby lodge where I was putting up during my internship, only to find my friend from college (let us call him ‘P’) all dressed up and ready to go. “Finish your breakfast and let’s go someplace.” He said, more charged up than he was on weekdays. “Where are we going?” I asked, groggy-eyed. He gave the smile of the sphinx and asked me to just make sure that my phone’s battery was fully charged. My filmy friend didn’t give any more hints until we ended up at Bandstand sometime around 2 in the afternoon. The oxymoron that is “Mumbai winter” ensuring that we were drenched in sweat. I had had enough of the mystery by then and asked P point blank what the plan was. “Are you aware of the term pilgrimage my friend?”, said P, and then pointed at the very ordinary looking complex in front of us. “Galaxy Apartments.” I said, and realized immediately what P was inferring. 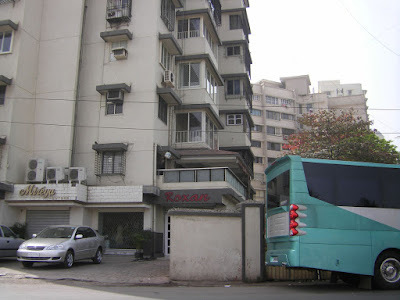 For those who don’t follow Bollywood – Galaxy Apartments is where THE Salman Khan resides. Calling P filmy – would be the understatement of the century. He is not just filmy, he is stalker level filmy, he is an encyclopedia so far as Bollywood is concerned, he knows the schedules of the stars, whether they are on outdoor shoots, which phone they are using and some claimed that P could identify vehicles of stars by their license plates, including TV actors. So when he said Salman Khan was 200 feet away, I knew Salman Khan WAS 200 feet away. “So what’s the plan?” I asked him. “Now we wait for him to show up.” He said, plonking himself on a cement bench that overlooked the apartment. He explained that it was customary for stars to show up and wave to the gathering of fans on weekends, and that was P’s grand plan....we would wait, until he acknowledged our presence by waving at us. “How long till he does that?” I asked. “Anything between half an hour to three hours as per my estimate.” P replied. Truth be told, this ordeal wasn’t what I was expecting, but given the fact that I had nothing better to do, and I was a major Bhaitard/BhaiBhakt once, I made myself comfortable. “Aap bhi bhai se milne aaye hai?” [You too have come to meet bhai?] said a voice from behind. We turned around to see who else could be crazy enough to waste their Sunday in bhai-spotting, or for that matter confusing ‘celeb spotting’ with ‘celeb meeting’, but one look and we knew that this guy was serious. In terms fan level, on a scale of 1 to 10, this guy was obviously level infinity square. His hairstyle was ‘Tere Naam’, he had the faux turquoise bracelet, the faded jeans with patchwork, and his shirt….well, the only way he could go more ‘Salman’ was if he went shirtless, but he wasn’t (perhaps because his physique was the one thing he couldn’t Salman-ize). Instead, his preferred attire resembled the vomit of a chameleon that had eaten a rainbow and had peacock feathers for dessert - the kind of clothing that you get to see on Chiragh Din ads, and make you wonder who actually buy these. Judge not, lest thy be judged. The three of us soon got talking, his name was Subodh and he was from some town in Uttar Pradesh, the sole purpose of his week-long visit to Mumbai was to ‘meet’ Salman Khan. “I am bhai’s biggest fan”, he proclaimed, as I nodded, P had trouble accepting this fact, but he eventually reconciled himself to this, the fact that P had never thought of embracing the bracelet, hairstyle and more importantly the clothes was the crucial factor. “I have been loitering around here all week, and I have seen everyone from the family - Sohail, Arbaaz, Malaika. Salim Khan actually spoke to me one morning, he was going out for a walk. But I haven’t yet met Bhai.” He lamented. We asked him what did he and Salim Khan talk about, and he admitted that he was sternly told to go back to his town and not waste his time. “But I must meet Salmanbhai….else my entire trip will be fruitless.” He was afraid to think of the consequences if he didn’t get to meet Salman. “I have promised my cousin that I will bring him Bhai’s autograph”, and just as we were about to ask him when he was supposed to be returning, he told us that his train was in the evening. P tried to cheer him up, “it’s just 2pm, you have plenty of time.” and Subodh seemed to brighten up a bit at the thought. We must have made a funny sight, the three of us sitting on a bench, ignoring the heat and staring at a balcony of the flat opposite us, from where we expected Salman Khan to jump out any second, and call us by our first names. But of course, he didn't. P formed a special connection with our companion by virtue of the fact that he hailed from the same state, and I too joined in on the conversation. He worked as an electrician and was roughly the same age as us, and in spite of the superficial differences, we formed a bond thanks to our shared love of Salman Khan. Hours rolled by, and P and I started getting impatient, we came to know from Subodh that Bhai being at home need not translate to him giving a darshan to his fans. "Last Sunday also, I was here, he was here....so was the crowd...but he didn't come out." "Wait, what crowd? Today there are just three of us." "Oh, you'll see..not too long now, they will start coming. All pretending to be his biggest fan." Subodh replied, with no attempt to hide the contempt for the pretenders. I exchanged a glance with P, surely in a city like Mumbai where spotting celebrities was not too big a deal, there wouldn't be a crowd in front of Salman Khan 's house, just for his glimpse. But as the day wore on and the sun started dipping into the Arabian sea behind us, a funny thing started to happen. Just as Subodh had said, other people joined us in front of the apartment, we were no longer the only losers who had nothing better to do, there were plenty of us. Autos started slowing down while crossing the road, some stopped altogether, and curious folks alighted and joined the gathering. While a lot of them were casual fans, I noted that there were other die-hards not very much unlike Subodh. Before long, it seemed like the whole of Bandstand was standing with us. There was pushing and shoving because the footpath could only take so much, and the crowd spilt over to the road, creating a traffic jam in the process. Our friend had gotten separated from us, but we managed to track him amidst the chaos. “He isn’t going to show up, is he?” he asked, more to himself than us. P tried to sound hopeful, "Maybe he will, you know how Bhai is...always late." "But I can't be late for my train, 10 more minutes, then I would better get going." We didn't respond, nothing that we could have said would have probably helped...we had been here for only three hours, and were on the verge of giving up, for someone who had come to the city with this single aim, and was virtually spending his day and night waiting for a glimpse of the star, and failing, it must have been hard - accepting defeat. He drifted away from us once again, but remained in the crowd. And then, after what could have been five minutes, or half an hour....Salman Khan showed up. In an unreasonably tight pink tee, with his dishevelled hair falling on his face, looking every bit the cocky superstar that he is, he waved and smiled, and the crowd went crazy. Chants of ‘Salman Salman’ filled the air, and I witnessed a level of mass hysteria that I have never seen before or since. And then he went back to wherever he had come from. Almost immediately the gathering started to scatter. we looked around for Subodh, but we couldn't spot him. soon, it was again just the two of us. "You think he was still there when Salman came?" I asked P on our way back. "I don't think so, he said that he would be leaving in ten minutes, Salman came out at least 20 minutes after that." "Impossible, couldn't have been more than 5 minutes." I said. "We couldn't say bye to him." P said. And that was that, we couldn't tell for sure if Subodh did get to see Salman Khan that day. Needless to say, neither of us ever met Subodh after that. Unlike Marine drive, I do happen to visit Bandstand from time to time, I go past galaxy apartments too, and sometimes when it's a weekend, and I see a crowd gathered outside, I think of that afternoon from 9 years ago. And the funny thing is that, it's not Salman Khan I yearn to see, but that man from the small town of UP with the Tere Naam hairstyle and the weird shirt. Nicely written, specially the last three lines.